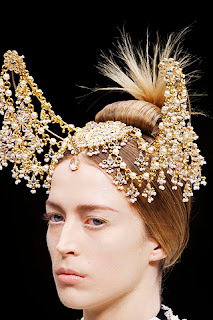 Many designers have been playing with head accessories in the coming 2008 fall/winter collections. Designs range from intricate jewel pieces, whimsical hats to scary looking fur hats. 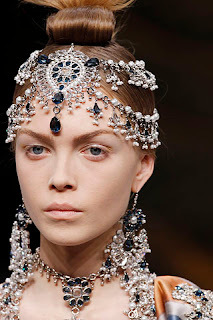 Alexander McQueen showed intricate jeweled head pieces that are truly savvy worthy. 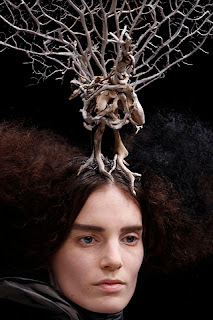 There is a particularly interesting head piece resembling a peacock standing on top of the model's head. What is going on there? But, it's interesting in a bizzare fashion. 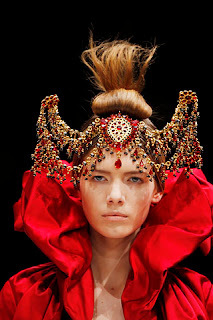 These Alexander McQueen pieces remind me of a long ago time when knights and ladies rule the land. Savvy gal imagines herself wearing these pieces atop of her head, garb in rich velevt and satin long tunic dresses adorn with gold and silver ornaments. 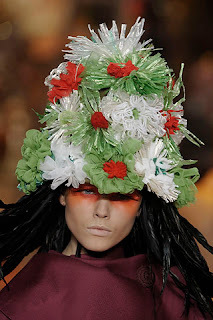 Hats at John Galliano's show remind me of the dream like world of Cirque du Soleil. I adore the pale blue feather hat on the left. Wearing these hats to an afternoon tea would sure gain much attention. 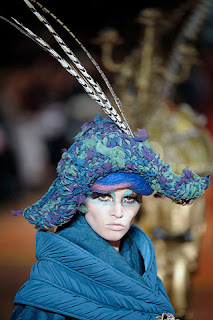 John Galliano created a dream like whimiscal state allowing the inner child within an adult out to play. A gal can usually count on Jean Paul Gaultier to create interesting, dramatic fashion pieces but these fur hats are just scary. They look like an animal is sitting on top of the model's head. So are you a hat person and what is a savvy hat to you? I do like hats, more casual looking though and I love scarfs as headgear too!! The bejeweled pieces are spectacular, I would most definitely wear them...the dead marmots, not so much! Talk about over the top! I think a fabulous fur hat can be very chic. Personally, I favor newsboy caps and berets, and skullcaps when it's icy cold out. In the winter, I wear a hat just about every day. Have a cute brown fedora that I have yet to debut but I'm pretty psyched about wearing it come fall! These are so wonderful and inspiring, but I feel largely unwearable--sadly! I think McQueen's could work for parties though. Vintage fascinators I think are the way to go.